On the 13th January Tim Parkinson was invited to speak at the launch event of the 2015 Keighley Business Awards. 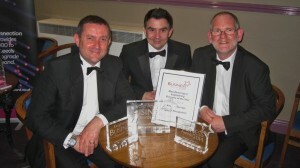 Last year Airedale Springs scooped 3 awards including Overall Business of the Year. L/R Sean Parkinson Commercial Director, Steve Hart Production Director, Tim Parkinson Chairman. Due to its previous successes in 2013 and 2014 Airedale Springs is unable to enter an award this year however it is pleased to be sponsoring the category for “Large Business of the Year” in 2015. The Keighley Business Awards are an ideal opportunity to promote local enterprise and we look forward to the awards ceremony and gala dinner on the 12th June which will be compered once again by BBC Look North presenter Harry Gration.